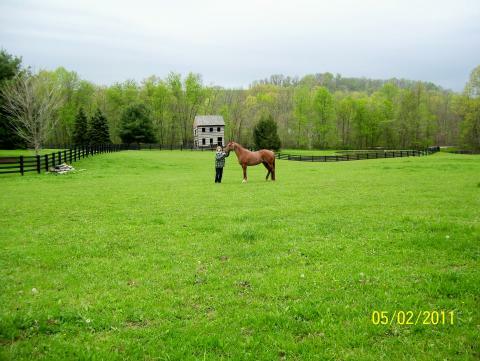 I bought Dusty, a 5 year old Quarter Horse gelding because of his disposition. I needed a good quiet trail horse. I knew when I got him that his feet looked very bad. He had shoes on and I talked to the farrier who shod him about his front feet. He told me not to worry, Dusty was fine. Two weeks after I bought him his front shoes fell off. My farrier reset the shoes and two weeks later they fell off again. Poor Dusty had very weak hoof walls and two quarter cracks. We decided to pull all his shoes and my farrier suggested hoof boots for the front. Dusty could hardly walk on his bare feet and I was very concerned. He also developed an abscess within 6 months. 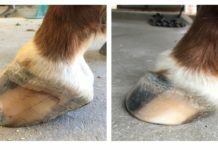 With EasySoakers and front hoof boots and a lot of trims, Dusty’s front hooves are in much better shape. The quarter cracks grew out. His feet have toughened up and he is much more comfortable now. Dusty is a big horse and I think his front feet are too small for his body. Putting shoes on him makes his hooves crack. I believe in doing what works best for the horse. I am not anti-shoe, but think in most cases, barefoot is best. 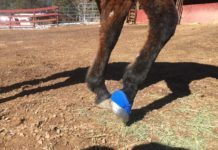 Hoof boots have made a difference for Dusty and I am glad I have them. 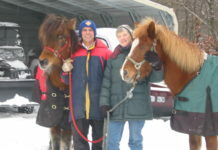 I use Old Mac’s G2 and they have lasted through four summers of trail riding just fine. I replace pads and gaiters now and then.